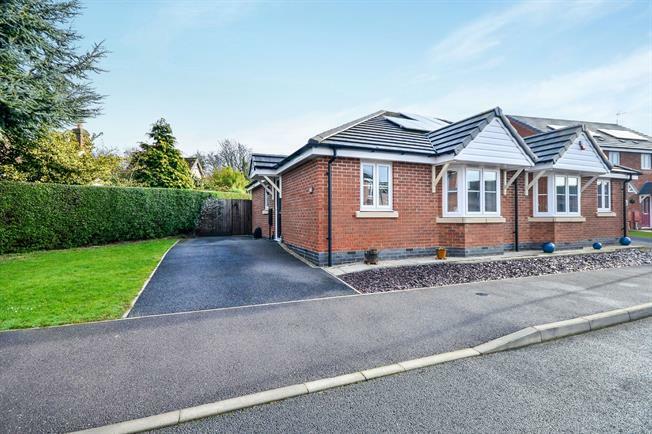 2 Bedroom Semi Detached Bungalow For Sale in Sutton-in-Ashfield for Offers Over £140,000. Two bedroom semi detached bungalow, ideally situated on the ever popular Ashfield Estate offering great A38 and M1 access. The property has driveway parking for two to three cars and an enclosed rear garden with patio, shed and lawn. Internally there is an entrance hallway with useful storage cupboard, bathroom with shower over the bath, two bedrooms, the largest having a bay window, a lounge diner with French doors to the patio, and a kitchen with space for appliances and a window overlooking the garden. The property benefits from zoned heating, owned solar panels and is wheelchair friendly. Composite double glazed door, loft access. Single radiator, vinyl flooring. Door to storage cupboard. UPVC French double glazed door. Double radiator. Door to kitchen. Double glazed uPVC window. Double radiator, tiled flooring, built-in storage cupboard housing the boiler, tiled splashbacks. Roll edge work surface, wall and base units, stainless steel sink with mixer tap and drainer, electric oven, induction hob, overhead extractor, space for washing machine, space for fridge/freezer. Double glazed uPVC bay window. Double radiator. Double glazed uPVC window with frosted glass. Heated towel rail, vinyl flooring, part tiled walls. Low flush WC, panelled bath with mixer tap, shower over bath, pedestal sink with mixer tap, extractor fan and shaving point. Slate chip frontage with slab path for maintenance. Driveway to the side for two to three cars leading to a gated access into the rear garden. There is an undercover area at the entrance door with wall mounted light, lawn garden to side leading to a gravel area with feature tree. The rear garden has a slab patio, lawn garden with stepping stone path leading to a shed with a storage area beyond.